After the sugar overload of December, I promised healthier eating in the new year. For me, that usually starts with soup. I love soup, especially soups that fill you up for lunch. Sometimes I’m in the mood for a smooth one made with beans or vegetables and then pureed – no cream required. Other times, I crave a brothy bowl filled with vegetables or beans. So far in 2019, brothy soups have been the star. I started the year with a wonderful onion soup made with sweet red onions offset by the tang of Dijon mustard, balsamic vinegar and soy sauce. It was easy and delicious. Cheesy toasts on top made this a perfect lunch. Cook the Book Fridays’ first recipe from Everyday Dorie this year is another hearty brothy soup: Potato Chowder, Lots of Ways. Dorie Greenspan gives a basic formula along with suggestions on tweaking the ingredients depending on the season as well as other ideas for giving the soup your own flair. Though called potato chowder, the soup includes an almost equal (or maybe greater) amount of alliums. 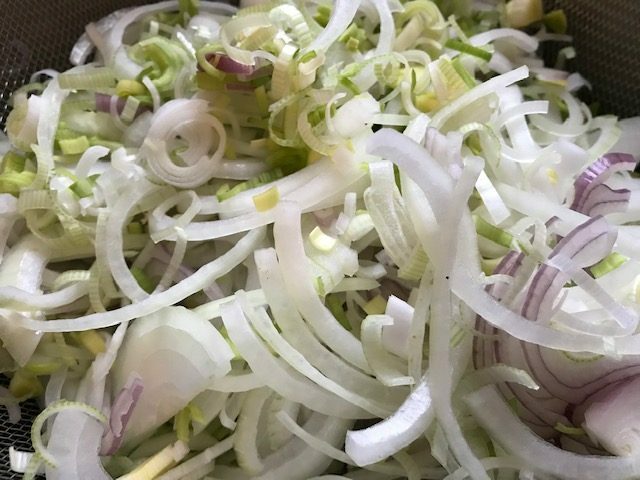 There are onions, leeks, shallots AND garlic. I even used leeks I grew in my garden last summer (they’re storing well in the fridge). I didn’t have any bacon on hand, but I did have a jar of bacon fat, so that’s what I used to sauté the alliums. Once they’re soft, broth and the requisite potatoes are added to the pot. I had some containers of corn stock in the freezer, made this summer from corn cobs. I thought that would be nice with the bacon undertones. I also added a tablespoon of Old Bay seasoning to evoke memories of childhood summers in Maryland. Once the potatoes are tender (about 20 minutes), they are mashed in the pot to give the soup some body. You could optionally add some cream, but it didn’t seem necessary. And I’m focusing on less decadent eating for January. It’s cold outside, but this soup warms you from the inside. The stock was sweet, and the flavor of corn was distinct, more than I expected. It complemented the bacon and Old Bay perfectly. 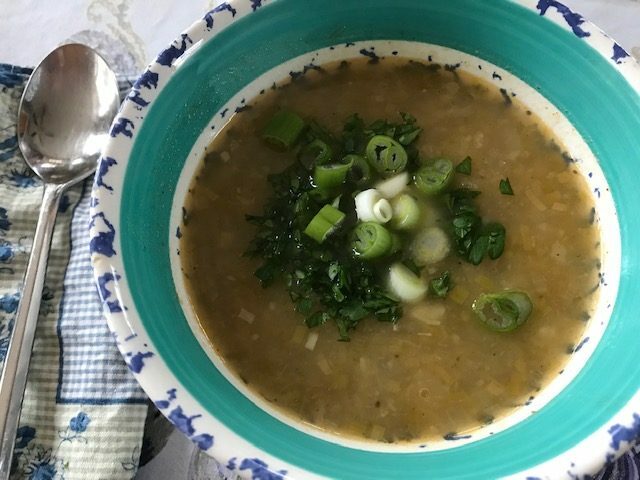 The soup is rather beige, but sliced scallions and chopped parsley added the needed color to the bowl. This is a perfect recipe to have in your back pocket. The basic ingredients are always on hand, at least at my house, and the ways to vary the pot to use other things in your pantry are limitless. I’m looking forward to having fun with other combinations as the seasons evolve. To see how others in Cook the Book Fridays dressed up their chowder, check out there links here. And to try it yourself, you can find the recipe in page 63 of Dorie Greenspan’s newest book, Everyday Dorie.